Driving back home to Ann Arbor Michigan from visiting Punxsutawney Phil for the first time on Groundhogs Day, I was listening to a CD mix of songs my brother had made as part of a music exchange my friends and I shared called the Great Mix Experiment (GME). On his mix, nearly perfectly timed to a fresh blast of big later winter flakes off the Southeastern edge of Lake Erie, played "It Covers the Hillsides" by Midlake. This combination of music, friendships, family, and the end of a frigid winter that year came together across the windshield of my car shaping into this story. There are different types of snowflakes in the Great Lakes. Sometimes snow is big, like the flakes that day, other times wet and slushy, others are pellets of frozen pain on that pelts the skin. The connection that there are different types of people in my life came to me. Sometimes people are flakey. People can be mushy. There are some who are hard, and cold, icy in the way they hold others off. The complexity of people, like the intricacy of a snowflakes design, is worthy of study. The story comes from the heart. It is an ode to the memories of a Michigan I grew up in, that continues to try and rebuild into a better place. There are things I can point to in the novel that is very much a part of my life, like the cars, and the music, and that windmill location to the central part of the big mitten where I find tranquility. There are parts which are just story, and drama which is purely fiction. I will let the readers decide the rest, and hope they enjoy the journey. Characters in this work are a hyperinflation amalgam of people, stories, and rumors collected over time. During the writing of this novel, a new and wonderful independent bookstore opened near my house. I imagined that if I were a smart business person, in this digital day, what would I open there instead of a bookstore. It turned out to be a greeting card company (This may have been inspired by a client of the software company I was working at). If the protagonist was a business owner, how would he live to keep the business running? Business owners I have known seem always to juggle a business life with personal life, dropping some of the balls along the way. How many balls could our protagonist juggle? What happens when some of those balls change weight, importance, size, or speed. I then took the different types of snowflakes and started to assign different family members to those creating heightened patterns and relationship constructs to see just how far I could turn up the heat without making things melt. What you are reading in The Symmetry of Snowflakes is the result. It's not a love story. Instead, a story about the complexity of relationships. The gray, overcast Ann Arbor sky sheds its first snowfall of the year. I watch the flakes from outside my second-floor office window at RedMitten Greetings. It is the end of my day. It is the Wednesday before Thanksgiving. The cobweb on an exterior windowsill holds steady despite the cold updraft. The bank sign across Main Street alternates between “6:11 p.m.” and “29°.” More than time and temperature, these two points of data tell me “put on jacket” and “meet friends for dinner.” Still, I sit and wait, lingering in the moments that are mine, free from the entanglements of others, alone in the last of my own thoughts. I am on the precipice of what has become an annual trial—several long weeks that will test my character and prove my endurance. It would make me feel noble and masculine to tell you the challenges ahead involve physical speed or strength, but no, the days ahead will be a test of memory, fortitude, and tolerance. Each Thanksgiving marks the start of a holiday season, which for me does not end until January 10, my birthday. I have long accommodated the separate parent visits, the making of compromises, the assimilation with new marriages, the new family traditions. When I live “my own life” and have a family, friends, and rituals of my own, I hope to leave this tough season behind me. The Internet tells me that there are thirty-five types of snowflakes. Some are complex, others are simple, and yet no two are ever alike. We can grow them in a lab. They occur in nature. Alone, a snowflake can be amazing and wonderful. I’ve found that there are at least that many types of people. Some are complex, others are simple, and yet no two are ever alike. We can grow them in test tubes. A person can be amazing and wonderful. However, I find that most will be big flakes during this, the coldest of seasons. “6:15 p.m.” and “28°” tell me again “put on jacket” and “hurry to friends.” I am delayed, but not because of them. They are the lee of my emotional turbulence, my shelter from the icy wind. Still, I do not want to keep them waiting too long. The bank sign is correct. It is cold outside, and I have six blocks to go before reaching our favorite Irish pub. I am the last one out of the office by over three hours. As I walk, the backlog of work churns in my mind…staff schedules, making payroll, marketing expenses, press releases, sales, system maintenance. I decompress and try to breathe deeply with each step. After years of reinvesting every penny earned into my business, it finally may pay off. Just this week I received an offer from a large greeting card company in Missouri. They want to purchase RedMitten Greetings, pitching with phrases like young, leading edge, investment support for such a stable, maturing goliath peppered throughout. Five blocks still to go, so I try to focus on the snow. Each flake melts as it hits warmer ground. This is “show snow,” an opening act. The “show flakes” are large, white, full, pretty. It is the snow of movies and songs tied to the holidays, but it will not last. “Show flakes” want to be something more substantial, like a December blanket or February blizzard, but their dendrites are no match for the warm earth still cooling as the hours of daylight become shorter and shorter. 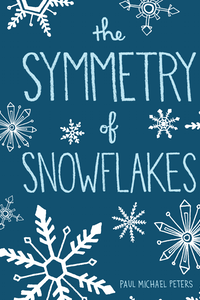 Snowflakes are symmetrical. “Symmetry” can be precise, mathematical, scientific, or, simply beautiful—balanced by both form and proportion. Closing my eyes to think of the perfect snowflake, I visualize the fernlike Stellar Dendrite. With six arms, spikes and spindles of crystal, and ideal ice shafts, it is a thing of beauty. Like a glass etching, done by a skilled and steady hand, the lines that form each crystalline structure are striking. Still, with at least thirty-two additional types of snowflakes, few look anything like this under a microscope. Mathematical symmetry is different. Frozen water molecules want to align with hydrogen, but this does not form strong bonds, so they are compelled to be together in groups that fit just right, even if there is a weakness. Locked in the hexagonal shape of hydrogen, each crystal becomes a geometrical wonder of interlocked strength and delicate design, each staying with us only the shortest of time. How is it that we still do not know everything about something as simple as a snowflake? Much debate surrounds the mechanism that holds snowflakes together. Is it electrostatic, mechanical, or some supersticky liquid state at certain temperatures? For all I know, it could be love that brings a stray partial and water droplet together in some Shakespearean drama. He, the particle, came from the wrong side of the Great Divide high in the atmosphere; she, the droplet from a noble nimbus cloud family, who would never bond with such a piece of dirt. They unite as lovers, the “Mono-particles” and “Dropulets.” We understand that something between them connects, but not why, and they form something greater than the individual parts, a beautiful snowflake. I can see the gang at a table near the front of the bar, which is clean, dimly lit, and warm inside. They saved me a seat by the crackling hearth, and a drink waits. My friends are lifelong. I have known them since college. We were all in a social fraternity together, which explains their funny nicknames: Pike, Knobby, and Dord. Pike, Knobby, and Dord are married to wonderful women—Michelle, Kate, and Jean. I only wish I could find a woman to love me who is equally amazing. Our early years together were much like you would imagine for college age. Our fraternity members were known for things other than the ability to party, get girls, or play sports. We had the highest GPAs on campus and were all very involved in extracurricular organizations. The bonds with my six-sided friend-flake include shared values. We are not in unison on issues such as politics, religion, culture, or even music. It would be a rare day when two of us say the same thing on any of those subjects. Pike, Knobby, and Dord all grew up in small farm towns near Lake Michigan. These three boys can talk farm equipment, corn crops, ethanol, and Farmer’s Almanac like no one else I know. Four-H, Boy Scouts, and working late-summer hours with their dads are all activities that build a certain character. Michelle, Kate, and Jean are from small towns in Michigan. They expect men to know how to fix and build things, which fortunately these men do. Honesty and integrity are important. In exchange for this, Michelle, Kate, and Jean have a loyalty to their husbands that is deep and vital. Not having grown up on a farm, I do not have the strong farm-boy character, and I am not married to one of the greatest women of our time. Most people use my full name, Hank Hanson, as I don’t have a nickname. This group just calls me Hanson. I am twenty-nine and single…have been for nearly a year now. I am greeted by a cheer of “Hanson!” Seated with the people I trust more than any others, daresay, love, in the most comfortable of settings, I should feel better as the gin and tonic warms my blood. “You’re just in time, I was about to tell everyone about the farm report from my dad this morning,” Dord says. “Oh good, I didn’t miss it,” I reply. The boys are interested in his father’s take on the rise in commodities and the effect it will have on winter crops. “Oh, that’s really nice; I would do it in a heartbeat if I didn’t already have to eat crepes with P3 in the morning and Entenmann’s at P4’s,” I said. “I was saying that I can’t make it over to her parents tomorrow,” I reply. “No, no, his father’s second wife’s son,” he adds with a laugh. “I thought that you just drove laps around the city playing some geocaching game putting miles on that hoopdee you drive,” Jean says. They look at me with what seems pity. It might be confusion, like the first time they found out. Sadly, I was not kidding. It makes me wonder if the family isn’t just blended, but pulverized. The answer to the original question is that one can always send flowers. It came to us after dinner and video games, and three bottles of Miller High Life apiece. In fact, flowers are what you should send to any female in my family, along with a personal note if a significant event occurs. For men, a card is enough. In rudimentary terms, my family starts with my dearly departed mother—parental unit number 1, or P1 for short. She remarried twice, first to a man I refer to as P3, and then to her third husband, P5. Dad is parental unit number 2, or P2. His third and current wife, Midge, is P6. Between his first wife and Midge is P4, Tess. There are children from these unions. I have two full-blooded siblings, my brother, Mark, and sister, Lisa. I have two half-siblings, partially connected to me, and four stepsiblings—people the courts say I am, or was at one time, related to. In addition, there are people one might think should be relatives, but who are not. These are the children of spouses born prior to when either of my parents was involved in the various families. Looking back, I like to say that they peaked with me and it was all downhill from there, though I recognize it is a nearly cruel and pointed jab at the life choices of others. Consider my relationships with each of them. For instance, my father’s second wife played more of a role as a stepmother than his current wife, who is closer in age, like a babysitter. Neither could be as wonderful as my biological mother, yet these two women, forced into my life, require attention. “Hanson, are you actually ready for Thanksgiving? I mean, with all those people, don’t they press your buttons?” Dord asks. “It can’t be that bad, Hank Hanson,” Kate says. “Yeah, you are blessed,” Knobby says with a laugh. “Still, my father gets to choose my family,” I say. “Is that the one your brother used to date?” Michelle asks. “They are one and the same,” I say. “How is your brother, Mark?” Dord asks. “Anyone know what the lottery is up to this week?” Michelle asks, finding a break in the conversation. “It’s only at nine million,” Knobby says. “You’ve given this considerable thought,” Kate says. “I have, honey, and you, my love, deserve more than five hundred thousand after taxes to build interest. You, my dear, need at least twenty million dollars to leave your job,” Knobby says with a slap of his open hand to the table, making dishes jump up and rattle. During this, the busiest night of the year for every bar, pub, and pool hall in Michigan, we feel the crowd start to press against our table and the volume of the music rise. It is time to go. With reassurances to everyone that I will be fine walking the six blocks to my loft apartment over RedMitten Greetings, the ladies kiss me good night. Kate gives an added embrace, saying, “Call if you need anything.” The guys give hearty handshakes and the masculine half hug. Minutes later I am in my apartment and listening to my old-fashioned two-tape answering machine, which sounds off several reminders of the Thanksgiving Day itinerary.